Sometimes the road makes a turn, and you just have to stay on it. That was the case in finding myself at a Texas Parks & Wildlife Certification Workshop at Parrie Haynes Ranch about eight miles outside Killeen Texas, and located on the Lampasas River. I knew less than nothing when I was informed that I was signed up for the Texas Basic Fishing and Texas Master Angler certifications as well as a kayaking certification taught by Texas Parks and Wildlife Department employees at the beautiful Parrie Haynes Ranch. I was signed up by Shane Wilson the president of Fishing’s Future, a 501 c3 that I am on the board for, and handle their public relations on a regular basis. Day one was the kayaking portion, which was a morning of classroom, and an afternoon of kayaking on the water – about two miles down the Lampasis River to a predetermined takeout. Instruction was great, and the experience of our instructor was evident in both knowledge and presentation. If you are thinking of fishing the Lampasis, as always pay attention to the CFS, or cubic feet per second flow. Today, I found out the Lampasis was running at 29 cfs, and that my friends is a trickle. With such low flow, the river was dropping like a Texas lake in July. That meant we had to hop out of our Hobies and drag or push them about a dozen times – through gravel sandbars and other shallow spots. The first seven times were survivable, but I could definitely feel the last five. It’s not the drag or the walk that gets you, it’s the in-and-out. Today, day two, was dedicated to the fishing unit of certification, and I didn’t really know what to expect. I was pleasantly surprised to learn that the core of learning was focused on giving participants all the knowledge, and information necessary to put on Angler Education Classes and Activities. The amount of information and support would have to be seen to be believed. Let’s just say TPWD is committed to getting youth out and fishing – from the beginning tying knots, to activities on fishing ethics. In between, there were activities like owl calling last night, campfire cooking a la’ Dutch oven, all with the sub plot of outdoor learning for us to pass along. 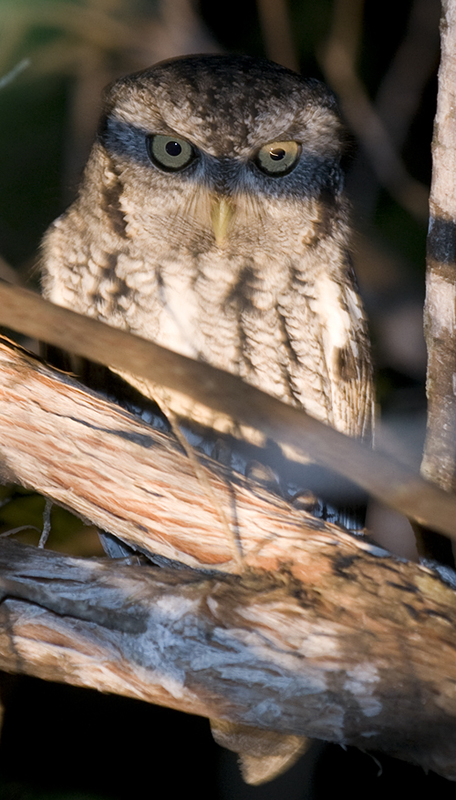 Leslie called a screech owl into our backyard about a week ago, so I knew it could be done, but our caller makes a living at calling all kinds of animals and birds with recorded sounds. As you can see, it was a successful night even if the owls did not land in the predetermined spot. To make a long story short, if you are interested in teaching youth to fish in an effort to expand the sport of fishing, there’s no reason to put off going through the TPWD programs. If you were looking for “backup,” you have found it, and if you want to “plug in” to an already organized, up and running angler education program, why not take a look at what you can do for and with TPWD’s angler education programs? And if you would like to see some video (to make a short story longer), let me know. I like the efforts made by TPWD and people like you to get more kids involved. I have 2 girls who love to fish, but more importantly for me, share a moment with dad that is not cluttered with everyday living. Teaching a kid these skills at an early age will go a long way to building trust, conservatorship, and a love of the outdoors. i’d like to see what sort of organized events could be done in north texas with your new certification. do you have any plans?